Could this please NOT be a thing? It is incredibly annoying to play and get ads spammed by players in map chat. Is that even allowed? Aren't there report options for spamming and for marketing/selling? Or is that only for selling gold. If they only post it occasionally and it's for something relevant like a GW2 Youtube page you probably can't stop them - other than blocking that specific player - but if they're doing it constantly or advertising things which are not GW2 related or against the games rules you can report them. It's pure and simple spam, if you see those message, block, report and go on. I don't think it's allowed, but either way if you find it annoying, you can turn off the map chat and be done with it. Maybe I'm a minority here, but I personally don't mind it when people advertise their Youtube or Twitch accounts. I applaud people who take the time to create content for the game. Last thing I'd wanna do when getting home from a long day at work is have to entertain people via stream, so I appreciate those who do it. I oftentimes will check out the link just to see what their content is like. The promoted content was not GW2 related. If you don't want it to be a thing, /block first (so you're not bothered by the same person again), then right-click the name submitting the message and /report (as spam, although the category you use won't ultimately matter much). if i'm in the mood, i type stuff to catch the GM's who don't know what they are doing. Found a few, of course. like can mapchat even see a swear/expletive word if the word profanity filter is up and set to too stronk which is like a must coz the game's base rating are for young people. i just say "Praise Lord-God, Al.lel.uia!" Hate this and also hate when they put on lfg to get thier twitch viewers up. Unless they are repeatedly spamming something I won't report them. But it is kind of annoying. I like that people want to make more content on youtube that is about GW2 and I like people bringing more attention to the game. But the spam in game is blech. People can promote their channels on other places. Make a video about GW2? Share the video on reddit or the forums. I can't even copypaste a link from chat in-game. I'm not going to go out of my way to retype a link into my browser. Just saw this bit. Ugh, yeah, if it wasn't GW2 related then I would report and try and ignore them. I will add, this is specifically what "Report" and "Block" options are for. That particular form of... "advertising"? is definitively spamming. That's the most direct, and most effective thing we can do. 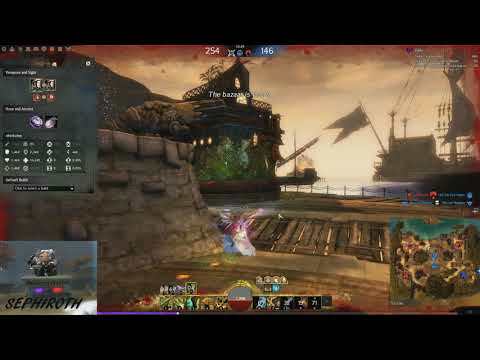 Hey man feeel free to check out my scrub Tempest PvP video! Spamming is a reportable offense. Just mentioning something once within context is not. When people ask for help, its alright to direct them to a channel. Dulfy, WoodenPotatoes, Tekkit, are some big names often directed to. Some other people want to spread awereness for activities or mechanic controls. As long as there’s a context and communication is kept to a social level, its fine. Promoting channels that have little to do with the game are always considered spam though. Just stick to what level of advertisement is socially acceptable. Just like when you go the city in real life. If it still offends you, the only thing you can do is block that person. And if you think that person exceeded the level of socially acceptable advertising, report them. But the issue with that is how do you sort through them all efficiently? What hasn't happened, and inevitably will, is the spam will start to escalate to content that has nothing to do with the game, click bait, or traps. No game in existence can reconcile the problem of external media being in active competition with the game for your attention. Same way in-game ads have extreme difficulty co-existing, because what they want is often in direct conflict with the platform its on. Unless theres some major paradigm shift, with inception levels of media bombardment in-game, the available bandwidth a person can split between things is incredibly limited. Personally I find Streamers severely underutilized their platforms, partly due to how much or little they can engage directly with the community. Participating with the audience is golden, but those participating are pulled out of the main advertising loop (stream ads, etc). If you go with Patreon-like funding, the system becomes more of a closed loop; better for participation, but makes the concept of streaming a little weird. When its all said and done, Streams have the most value in 3 situations..... Advertising the community, letting people watch game stuff when not playing, or watch game stuff and never play. The last one is ...... kind of not healthy, when you could be in the second category very easily. As for the first, that makes the most sense to advertising to people who AREN'T in the game yet, and looking for an opportunity get in. The exception to these are the Encyclopedia content creators, like Wooden Potatoes. But that type of content does better in archival formats like youtube videos, etc. Things people can look up for find information, and not just watch for the sake of watching. If anything, these informational libraries are by far the best to advertise in game, as they compliment the player's activity rather then overlap with it. Having mulled it over on and off for years, the only somewhat obvious change that could mesh the internal nature of the game, and the external nature of content creators, is to go so meta, that they are integrated into the game content. Theme park games aren't designed in a way where this can canonically make sense; but sandbox type games could run wild with it. Building an entertainment industry within the scope of the game world, using the game to relay that content to them. The one major hurdle though is quality control. Can someone who lambasts/hates the game be made into entertainment for the players because of their views? In-lore vs out of lore? Sponsored or Independent? If anyone here played Starwars Galaxy, you probably have a rough idea of what I'm talking about. The equivalent of a player being town crier, entertainer, or TV star, if given the tools to broadcast out to the masses.... or even something as small as the local system. That would be the content creator holy grail; combining both the external media with the in-game media to reach the status of an entity associated with the game. I'm going to have to go on record with "um, no, just watching a game that you're not playing/not going to play on a stream isn't bad". I just watched a PUBG stream the other day, hosted by the guy that owns Ironworks Gaming. I have no intention of playing it, because FPS games are not my cup of tea, but it was still fun to watch, and if anyone asked me about it, I could actually comment on it from a more informed position than I could if I'd never watched it, and since I hit a lot of gaming sites, that's not a bad thing, and puts me in closer to 1, I guess, as a potential advertiser for the game, even if I'm not going to play it. I actually thought for one second some of these build sites for this game actually came back but it was for this same thing just a new build created with go to xyz to learn more lol. Anyone who has the filter turned off can see what was said even if the person typing it can not. It happned in the past and the best solution is to block and report. what's the default setting of the profanity filter? if you turned that off, that means you should be thick skinned. otherwise, what's the point of turning off the profanity filter? I mean, I turned mine off because I don't care about profanity. I was simply responding to a question that was asked "can mapchat even see a swear/expletive word if the word profanity filter is up and set" leading me to believe that they were under the mistaken impression that if they had the filter on, other people without the filter couldn't see what they were saying. That's just not true.